When safety of pedestrians is topmost priority in the 21stcentury, government’s lack of vision has made life of common people like us “extremely difficult and risky” on the roads in Guwahati city. Traffic on Guwahati roads is crazy. Even the management of traffic in the largest city of northeast India is highly unscientific and unwise. The decision to construct foot over bridges has still not eased the risk of crossing the busy roads. 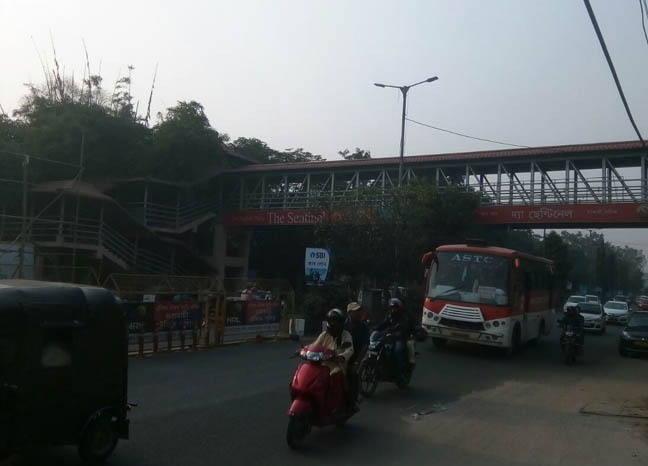 There are four foot over bridges in Guwahati – one at Dispur, the second one at Lachitnagar, one in Machkhowa and the last one in Maligaon Chariali. Because of totally wrong architecture and placement, pedestrians don’t use the facilities, and prefer to cross the busy roads. The foot over bridges at Maligaon, Machkhowa and Lachitnagar are too high, and pedestrians, especially the elderly people find it extremely difficult to scale them. As per my assessment, only 2 per cent of the pedestrians crossing the road use the overhead facilities. Similarly, the footbridge in front of the state secretariat is wrongly placed. People mostly cross the road near Ganesguri bus stop and the over head road crossing facility in front of the capital complex mostly remains unused. There are several incidents of people being hit by speeding vehicles while trying to cross roads in Ganeshguri. Some people in Maligaon complained that the civic administration often keep the foot over bridge closed for general public because of security reasons. Why cannot out architects and city planners try and make a usability audit of the existing facilities on the roads of Guwahati? Do we actually need to the foot over bridges?